Answer question nos. 1-2 on the basis of the following letter. At the December 3, 2011 meeting, it was decided that no two officers would hold positions on the same committee. It has recently come to my attention that both Chaitanya Rao and Ajit Singh will be serving in some capacity on the Cultural Committee, and both have been nominated for officer status. As you know, this is in direct disregard for the rules as voted by the Members Council last December 3, 2011. I would hope that sufficient action be taken by the Disciplinary Committee (on which committee both of the above are members) so that this problem will be remedied. 1. Which of the following is an essential flaw that the writer of the letter overlooked? (1) Rao and Ajit are already serving together on the Disciplinary Committee. (2) The Chairman has no power in the matter. (3) The Members Council cannot pass rules limiting members. (4) Rao and Ajit are yet to be confirmed as officers. (5) Cultural Committee is only active during the annual festival. 2. If both the nominations are confirmed, which of the following exhaustively and reasonably, describes actions that may occur in the near future? (1) Arvind resigns his membership. (2) Either Rao or Ajit resigns his membership. (3) Ajit resigns his committee post on the Cultural Committee. (4) Rao resigns his position on the Cultural Committee. (5) Either Rao or Ajit resigns his position from the Cultural Committee, and the other resigns his position on the Disciplinary Committee. Answer question nos. 3 – 5 on the basis of the information given in the following case. Due to increased competition, Ginger Automobiles, the Indian subsidiary of Pepper Automobile Company (PAC) reported lower sales and profits. PAC expects its new model Limo, developed especially for value conscious customers of India and China, would revive its fortunes. In order to prevent customers from buying competing products, PAC announced the launch of Limo six months before schedule. Due to unrest in its Indian supplier’s plant, deliveries of essential components for its main plant was hampered, and hence it decided to launch Limo in China only as per the original plan. Within a short span of time, Limo captured 30% market share in China, which was 200% higher than expected. Indian customers who had looked forward to purchasing Limo were becoming increasingly unhappy to the non-availability of Limo in India. Ginger’s dealers were worried about loss of business from the customers who might switch to other cars. 3. Statement I: In the Chinese market, Baft, and Hebe, are competing models in Limo’s target market. Due to increase in sales of Limo by 200%, Baft and Hebe saw their market share decline by 10%. Statement II: Baft and Hebe were not desired by the customers due to their new features. Which of the following conclusions can be most justifiably made? (1) suggest to customers to wait. (2) suggest to customers to consider purchasing any of the other PAC’s models available in showrooms, with a substantial discount along with gifts. (3) suggest to PAC to treat Indian and Chinese markets equally. (4) promise the top management of PAC higher sales/profit from Indian market compared to Chinese market. (5) suggest to the top management of PAC to manufacture essential components in either India or China. (1) collect the amount from Mr. Murugan. Later when the delivery is delayed, blame it on PAC’s problems. (2) collect 50% as advance and the remaining 50% after the confirmation of launch date by Ginger Automobiles. (3) collect the amount Mr. Murugan is willing to deposit after clarifying that delivery is subject to the company policy. (4) not collect the amount, but suggest to Mr. Murugan to write to Ginger Automobiles. (5) collect the amount and transfer it to the account of Ginger Automobiles, instead of keeping it in his personal account. Answer question nos. 6 – 9 on the basis of the information given in the following case. Tina a blast furnace expert, who works as a technology trouble-shooter stays in Jamshedpur. She has got an important assignment in Delhi, which requires six hours to complete. The work is so critical that she has to start working the moment she reaches the client’s premises. She is considering various options for her onward and return journey between Jamshedpur to Delhi. A quick search revealed that ticket from Jamshedpur to Delhi is available in two trains. Trains 12801 and 12443 depart from Jamshedpur station at 06:45 hrs and 15.55 hrs and reach Delhi next day at 04:50 hrs and 10:35 hrs respectively. Trains 12444 and 12802 start from Delhi at 17:20 hrs and 22:20 hrs and reach Jamshedpur next day at 10:35 hrs and 20:05 hrs respectively. Another option is to reach Ranchi by a three hour road trip and take a flight to Delhi from Ranchi. The distance between Ranchi and Delhi is covered in 105 minutes both-ways by any of the scheduled flights. Air India operates two flights, AI 9810 and AI 810, which depart Ranchi at 8:00 hrs and 15:25 hrs respectively. Flight number IT-3348 operated by Kingfisher Airlines departs Ranchi at 19:20 hrs. Return flights operated by Air India, AI 9809 and AI 809, depart Delhi at 5:50 hrs and 11:00 hrs respectively. Flight number IT-3347 operated by Kingfisher Airlines departs Delhi at 17:10 hrs. From Tina’s home Jamshedpur railway station is five minutes’ drive, and her destination at Delhi is 90 minutes and 30 minutes’ drive from airport and railway station respectively. One has to reach the airport at least one hour before the scheduled departure to complete the boarding procedure. At every railway station she loses five minutes in navigating through the crowd. (1) AI 9810 and return by IT 3347. (2) AI 9810 and return by train number 12802. (3) IT 3348 and return by AI 9809. (4) Train number 12443 and return by train number 12444. (5) AI 9810 and return by train number 12444. (1) Train 12443 and return by Train 12444. (2) Train 12801 and return by Train 12802. (3) AI 9810 and return by AI 9809. (4) AI 810 and return by AI 9809. (5) IT 3348 and return by IT 3347. Answer question nos. 10 – 15 on the basis of the information given in the following case. Teknik Group of industries had businesses in different sectors ranging from manufacturing, construction, fish farming and hotels. These different businesses operated as semi-independent units managed by the unit level managers. Teknik’s management had an internal consultancy group called as Business Advisory Group (known internally as BAG). The 15 experts in BAG were hired personally by Mr. Teknikwala, the owner of Teknik, who wanted this core group of experts to help his organization grow fast without facing the typical growth hurdles. Most of them were specialists in fields like law, information technology, human resource management, and operations management. Almost all of them had experience spanning decades in the industry. Whenever any of the units faced any significant problems, the unit level managers would put up a request for help to BAG. The problems ranged from installation of internal MIS systems, to financial advice related to leasing of equipment, to handling of employee grievances. Over a period of 20 years, Teknik’s revenues grew from ₹ 100 crore ₹ 10,000 crore with guidance of BAG and due to Mr. Tekinwala’s vision. Given its reputation in the industry, many people wanted to start their careers in BAG. Often young MBAs fresh out of business schools would apply. However their applications used to be rejected by Mr. Teknikwala, who had a preference for people with extensive industry experience. Things changed after the unfortunate demise of Mr. Teknikwala. His daughter Miss. Teknikwali took up the family business. She was an MBA from one of the premier business schools, and was working in a different company when Mr. Tekinwala passed away. She preferred that BAG developed new ideas and therefore inducted freshly graduated MBAs from premier business schools. She personally supervised the recruitment and selection process. Now the entire group constituted of 50 specialists, out of which 35 were the old time members. She also changed the reporting relationships in the BAG group with some of the older members being made to report to the new members. In IT team, Mr. Shiv, a newly recruited MBA, was made in-charge. For the older members it was a shock. However, as most of them were on the verge of retirement, and it would be challenging to search for new jobs while competing with younger professionals, they decided to play along. After one month, all business units were caught up in the ERP fever. This was an idea pushed by Ms. Teknikwali who the need the need to replace the old legacy systems with latest ERP system integrating all the units of Teknik. This was heavily influenced by her experience in the previous where an ERP system was already up and running. Therefore she was not aware of the difference between installing an ERP system and working on an already installed one. The ERP implementation in Teknik Group required extensive coordination with senior level managers of all units and it represented an extra work for those who were involved. This coordination was required to understand the different work processes and the users’ requirements. This coordination activity was being extensively managed by the old timers as they were familiar with internal processes and people in the different units. An external consultant was also hired for customization and implementation. After two months, BAG teams had to fortnightly present their progress to Ms. Teknikwali’s team. In the last meeting Ms. Teknikwali was dissatisfied. She explained her thinking that since ERP impacted every aspect of the business, the roll out had to be done faster. She wanted Mr. Shiv to get the implementation completed ahead of schedule. In the meeting she asked Mr. Shiv to get the people in IT team to be more productive. Not willing to disagree, Mr. Shiv committed to a roll-out schedule of complete ERP system in 6 months instead of earlier decided 14 months. Next day, Mr. Shiv presented the revised project milestone to BAG members. He told them that in order to meet the deadline, the members were expected to work on week-ends till the completion of the project. Along with that, they were also expected to maintain their earlier standards of delivery time and quality for the normal trouble-shooting and internal advisory work. Mr. Shiv also pointed out that anyone whose performance did not meet the expectations would be subjected to formal disciplinary action. The meeting ended without any member commenting on Shiv’s ideas, although Mr. Shiv heard a lot of mumbling in the corridor. Over the week, Shiv noticed that the members seemed to avoid him and he had to make extra effort to get ideas from them. After a fortnight Shiv reviewed the attendance register and found the Mr. Lal, an old time member, had not come during the week-ends and certain decisions were held up due to lack of inputs from Mr. Lal. Mr. Shiv issued a written reprimand to Mr. Lal. He was speechless on receiving the reprimand but kept silent. It has been three days since that incident. Some of the senior members had put in request for transfer to other business units. It was rumoured that four senior legal experts had agreed to an offer from a law firm. Other senior members would sporadically come in late to work, citing health reasons. Almost all senior members now wanted a weekly work-routine to be prepared and given to them in advance so that they could deliver as per the schedule. This insistence on written communication was a problem as urgent problems or ad-hoc requests could not be foreseen and included. Also normal services to other business units were being unattended to, and there were complaints coming from the unit heads. 10. Which of the following could have been a better response of Mr. Shiv to Ms. Teknikwali’s request to re-schedule the ERP implementation? (1) Look at industry best practices regarding fast-tracking of ERP projects and then commit to a new deadline. (2) Consult the external consultant who was involved with ERP customization and implementation. (3) Create a smaller team of all the new recruits of BAG and present the idea to them alone. (4) Eliminate the reliance on external consultants as they would be slow. (5) Present the idea to BAG members and ask them to look at the feasibility of the entire plan. 11. Which of the following can be identified as the immediate cause for the problems in BAG? (1) Ms. Teknikwali’s decision to appoint Mr. Shiv as project lead for ERP implementation. (2) The incompetence of the consultant who was implementing the ERP project. (3) Lack of information about what was happening in the ERP project. (4) Infighting between new recruits and the older members of BAG group. (5) Unilateral decision making by Shiv. 12. How should Mr. Shiv cope with the situation now? Choose the best option, considering Mr. Shiv’s career would be at stake if the ERP project fails, and assuming that for carrying out the options, he has the necessary authority to do so. (1) Resign from BAG. The project cannot be done as per the re-scheduled time-table. Get a job in another company based on BAG’s brand-name. (2) Inform Ms. Teknikwali about the situation and get help from her to deal with the old time members. Some old members need to be fired so that others are also disciplined. (3) Align the new members of the BAG group to his side by promising them rewards at end of the project. Obtain approval from Ms. Teknikwali for the same. (4) Develop work-routines aligned to the ERP project requirements. Hire extra resources for dealing with other ad-hoc requirements and for the ERP project requirements. (5) Create a joint team of old members and new members within BAG to take care of ad-hoc requirements. They would be socialized in out-bound programmes like mountaineering etc., which will be conducted during weekends. 13. Of all the problems being faced in BAG, which of the following is neither discussed nor hinted at? (1) Ms. Teknikwali’s lack of faith on older members to implement new ideas. (2) The inability of the younger members to work along with the older members of BAG. (3) Mr. Shiv’s intention to impress Ms. Teknikwali by agreeing to a tougher deadline. (4) Ms. Teknikwali’s lack of understanding of the complexity of an ERP implementation. (5) Mr. Shiv’s lack of understanding of the sensitivities of the older members of BAG. (1) Discuss with the members as to what their views were about the company and solicit ideas on how to make it grow further. (2) Retire the entire team and hire a fresh team according to her criteria and her requirements. (3) Hire an external consultant who would have interacted with the BAG members on her behalf. (4) Ask the unit managers about the performance of the BAG group’s performance and productivity. After that have discussion with BAG members about unit managers’ performance. (5) Break down BAG into different sub-groups. It would be easy to tackle one sub-group at a time and do what she wanted to achieve. Answer question nos. 16 – 17 on the basis of the information given in the following case. Vivekananda Memorial Elocution Competition (VMEC) in Viswavijay Public School (VPS) has a history of forty years. Apart from the founder’s day and annual day celebrations, it is the most important event of the school. In recent times, due to the increased popularity of reality shows on television channels, and for various other reasons, the elocution competition lost its appeal. Interest of both students and parents has been eroding over a period of time. To ensure sufficient audience, Mr. Ivan, Head of English Department, introduced choral recitation for junior section as a part of elocution competition. Three classes, each consisting of forty students, get short listed for the final performance of choral singing on the day of VMEC. Most of the parents and family members of these students attend the function to encourage them. This initiative increased the number of people attending the elocution competition. Some teachers are unhappy with the emphasis given on the elocution competition, since they are expected to be present at the school on the day of competition, which normally happens on a weekend to accommodate the working parents. The teachers were not granted leave on the day of VMEC and they used to be unhappy regarding this aspect. 16. Ms Shabina, the principal of VPS, is aware that some of her teachers are unhappy. She wants to be seen as fair and just. Which option is the best one that she should exercise? (1) introduce separate music and dance competitions in same format as the elocution competition. (4) appoint a committee of teachers to come up with possible suggestions, and ensure that majority of committee members are staunch supporters of the current practices. (5) exercise the authority of the principal because she wants to retain all traditions. 17. A group of unhappy teachers have come up with a list of action plans for the consideration of their colleagues. The action plans are listed below. I. Exposing Mr. Ivan’s intentions behind the inclusion of choral recitation. II. Conduct an open house discussion to gauge the unhappiness and to identify possible solutions. IV. Demand compensation for their work on the day of VMEC. Answer question nos. 18 – 20 on the basis of the information given in the following case. Dev Anand, CEO of a construction company, recently escaped a potentially fatal accident. Dev had failed to notice a red light while driving his car and attending to his phone calls. His well-wishers advised him to get a suitable replacement for the previous driver Ram Singh, who had resigned three months back. Ram Singh was not just a driver, but also a trusted lieutenant for Dev Anand for the last five years. Ram used to interact with other drivers and gathered critical information that helped Dev in successfully bidding for different contracts. His inputs also helped Dev to identify some dishonest employees, and to retain crucial employees who were considering attractive offers from his competitors. Some of the senior employees did not like the informal influence of Ram and made it difficult for him to continue in the firm. Dev provided him an alternative job with one of his relatives. During the last three months Dev has considered different candidates for the post. The backgrounds of the candidates are given in the table below. Dev is primarily looking for a stable and trustworthy driver, who can be a suitable replacement for Ram. His family members do not want Dev to appoint a young driver, as most of them are inexperienced. Dev’s driver is an employee of the firm and hence the appointment has to be routed through the HR manager of the firm. The HR manager prefers to maintain parity among all employees of the firm. He also needs to ensure that the selection of a new driver does not lead to discontent among the senior employees of the firm. 19. In order to resolve the conflicting preferences, one of Dev’s friends suggested Dev, his family members and the HR manager to identify their most and the least preferred candidates without considering the concerns of other stakeholders. Which of the above three statements is/are in conformity with the information provided in the passage? 20. Who among the following five candidates is most likely to be rejected by the GM (HR)? Answer questions from 21 to 23 based on the case given below. Naresh was a small time civil contractor in a small city. His major clients were the residents who wanted ad-hoc work like painting, building extensions to be done. His just prices had made him a preferred contractor for most of the clients who preferred him over other civil contractors. Always he followed the principle that client had to be kept happy – only by doing so it would be a win-win situation for both. However due to the unpredictability of such orders from residents, Naresh used to be idle for substantial part of the year. As a consequence, he could not expand his business. His two children were growing up and his existing business could not support their expenses. The medical expense of his elderly parents was another drain on his resources. The constant rise of prices in medical care and medicines was another issue. For Naresh, family’s concern was predominant. Naresh was, therefore, under pressure to expand his business. He was the sole earning member of his family, and he had to ensure their well being. He thought that by expanding his business, not only would he be able to care for his family in a better way, as well as offer employment to more number of masons and labourers. That would benefit their families as well. Naresh drew the boundary of his society to include himself, his family members, his employees and their family members. For expansion, the only option in the city was to enlist as a contractor for government work. Before deciding, he sought advice from another contractor, Srikumar, who had been working on government projects for a long period of time. Srikumar followed the principle of always helping others, because he believed that he would be helped back in return some day. Srikumar had just one advice “The work is given to those who will win the bidding process and at the same time will give the maximum bribe. Prices quoted for work have to include bribes, else the bills will not get cleared and the supervisors will find multiple faults with the execution of work. This ensures survival and prosperity for contractors”. When asked about other contractors, Srikumar said “The government contractors are like a micro-society in themselves, almost like a brotherhood. Within that, they are highly competitive; however towards any external threat they are united to ensure no harm happens to any of their members”. 21. Naresh decided to work as a government contractor. Following Srikumar’s advice, he inflated the prices so that he could pay the bribes out the bills received. (1) Naresh is now totally unethical. (2) Naresh cannot be called totally ethical. (3) Naresh can be called ethical when it suits him. (4) Naresh is ethical to some extent. (5) Naresh is being totally ethical. (1) both Naresh and Srikumar are unethical. (2) Naresh is unethical while Srikumar is not. (3) both Naresh and Srikumar are ethical. (4) Naresh is ethical to a large extent, but no conclusion can be made about Srikumar. (5) Srikumar is unethical, but no conclusion can be made about Naresh. 23. Lankawala, another contractor, when faced with the new supervisor’s demand to reduce prices for government work, asked him to guarantee that no bribes would be taken, and only then prices would be reduced. This was said in front of everyone. At this the supervisor forced Lankawala out of the meeting and threatened to black-list him. Lankawala did not say anything and walked away. Blacklisting of a contractor by one government department implied that Lankawala would not be able to participate in any government departments’ works. In late evening, the city was abuzz with the news that the supervisor’s dead body was seen on the railway tracks. In the investigations that followed, no one who attended the meeting recounted the happenings in the meeting to the police. Getting involved in murder cases could lead to unpredictable outcomes such as becoming the potential suspect, or an accessory to the crime. Furthermore, cases could drag on for years, and one would have to appear in court as witnesses in response to court’s summons. This, for a contractor, was a serious threat to his business due to the disruptions created. However, Naresh wanted to speak out but was pressurized by Srikumar and other contractors not to, and as a result he did not. Due to this, the case was closed unresolved with no one found guilty. (1) Srikumar is immoral, but ethical, while Naresh is not unethical. (2) Naresh is ethical and moral, while other contractors are immoral and unethical. (3) Naresh, Srikumar and other contractors are both immoral and unethical. (4) Other contractors are moral, and they prevented Naresh from being immoral. (5) Other contractors are unethical, but no conclusion can be made about Naresh. Answer question nos. 24 – 25 on the basis of the information given in the following case. Saral Co. is operating in seven north-eastern states of the country. The organization has a history of participative decision making, wherein people deliberate openly about pros and cons of every important decision, and a broad consensus is taken before taking the final decision. In Saral Co. every employee gets a salary proportional to the sales achieved. A new General Manager (GM) joined during the beginning of this month and challenged the organization’s sole focus on sales to determine salaries. He urged the top management to include two more additional parameters in determining the salaries of the employees, viz. collection of information about competitors and the quality of relationship with the retailers. 24. Manohar, the highest earning employee for the last three years, vehemently opposes the GM’s proposal. Which of the following could be most likely reason for him to oppose the proposal? (1) He considers the proposal as a serious threat to his favourable position in Saral Co.
(2) He is not interested in collecting the information regarding competitors. (3) No clarity regarding the relative importance of the three parameters. (4) He is not interested in maintaining quality relationship with retailers. (5) He may need to work harder to earn the highest salary. 25. The top management of Saral Co. refused to implement the proposal of new GM from the beginning of next month, which of the following could be the most justified reason for the management’s refusal? (1) To ensure that no manager will get credit for a major change soon after joining. (2) To avoid attracting criticism for their failure to implement a similar scheme. (3) His past experience is limited to seven north-eastern states only. (4) The GM is new to the organization and he would require some time to implement the new plan. (5) The top management would need time to deliberate and get consensus. 26. “On a wing and a prayer the Indian team landed in Heathrow to take on their formidable oppenents”. 27. It _______ not look like a great deal today, but back then it was a coup: no man before _________ to import tea directly into Ireland. Which of the following was not implied in the above sentence? (3) The ‘libero’ was an Italian default for almost a quarter of a century. (4) AC Milan was not successful in Europe for almost a quarter of a century. (5) The Italians seldom used a ‘libero’ since late eighties. 30. The 2001 census showed a sharp fall in the literacy rate compared to 1991, but an increase in the literacy rate by 2006 suggests that between 1991 and 2006 India progressed in terms of literacy rate. Which of the following statements, if true, best refutes the above argument? (1) One of the causes of more literacy is the increased population growth rate. (2) Although there was no census in 2006 the information about the literacy rate is reliable. (3) Many of those who were illiterate in 2001 become literate by 2006. (4) The rate of fall in literacy rate between 1991 and 2001 was more than the rate of rise in literacy rate between 2001 and 2006. (5) The rise in literacy rate between 2001 and 2006 was due to persistent campaign on television and FM radio. (1) did not pay his bills. (2) misappropriated assets he was entrusted with. (3) engaged in circulating black money in the economy. (4) cheated on his spouse. 32. Read the sentences and choose the option that best arrange them in a logical order. A. Some of these are tangible while others are not. B. The micro factors look at brand building, product development, competition, pricing, decision making within organizations etc. C. Another way to classify these factors is to distinguish which of them are macro in nature and which of them are micro. D. The macro factors comprise government policies, state of the economy, changing demographics etc. E. The factors influencing forecasts include social, technological, economic, political, religious, ethnic, governmental, and natural factors. Read the following passage and provide appropriate answers for the questions 33 – 37. There is an essential and irreducible ‘duality’ in the normative conceptualization of an individual person. We can see the person in terms of his or her ‘agency’, recognizing and respecting his or her ability to form goals, commitments, values, etc., and we can also see the person in terms of his or her ‘well-being’. This dichotomy is lost in a model of exclusively self-interested motivation, in which a person’s agency must be entirely geared to his or her own well-being. But once that straitjacket of self-interested motivation is removed, it becomes possible to recognize the indisputable fact that the person’s agency can well be geared to considerations not covered – or at least not fully covered – by his or her own well-being. Agency may be seen as important (not just instrumentally for the pursuit of well-being, but also intrinsically), but that still leaves open the question as to how that agency is to be evaluated and appraised. Even though the use of one’s agency is a matter for oneself to judge, the need for careful assessment of aims, objective, allegiances, etc., and the conception of the good, may be important and exacting. To recognize the distinction between the ‘agency aspect’ and the ‘well-being aspect’ of a person does not require us to take the view that the person’s success as an agent must be independent, or completely separable from, his or her success in terms of well-being. A person may well feel happier and better off as a result of achieving what he or she wanted to achieve – perhaps for his or her family, or community, or class, or party, or some other cause. Also it is quite possible that a person’s well-being will go down as a result of frustration if there is some failure to achieve what he or she wanted to achieve as an agent, even though those achievements are not directly concerned with his or her well-being. There is really no sound basis for demanding that the agency aspect and the well-being aspect of a person should be independent of each other, and it is, I suppose, even possible that every change in one will affect the other as well. However, the point at issue is not the plausibility of their independence, but the sustainability and relevance of the distinction. The fact that two variables may be so related that one cannot change without the other, does not imply that they are the same variable, or that they will have the same values, or that the value of one can be obtained from the other on basis of some simple transformation. The importance of an agency achievement does not rest entirely on the enhancement of well-being that it may indirectly cause. The agency achievement and well-being achievement, both of which have some distinct importance, may be casually linked with each other, but this fact does not compromise the specific importance of either. In so far as utility – based welfare calculations concentrate only on the well-being of the person, ignoring the agency aspect, or actually fails to distinguish between the agency aspect and well-being aspect altogether, something of real importance is lost. (1) The value of a person’s well-being cannot be obtained from the value of her agency. (2) A person’s agency aspect is independent of her well-being aspect. (3) A person’s agency is important because her well-being must depend on her agency. (4) A person’s agency must be entirely geared towards her own well-being. (5) A person’s well-being will be dependent on her agency in all circumstances. 34. In the case of Japan, there is a strong empirical evidence to suggest that systematic departure from self-interested behavior, in the direction of duty, loyalty and goodwill have played a substantial part in industrial success. Which of the following in closest to the ideas presented in the passage? (1) Japanese are duty bound selfless people. (2) The sense of well-being of the Japanese people gets consistently enhanced due to this systematic departure from the self-interested behavior. (3) Had there been no enhancement of their own well-being, the Japanese people would have not been dutiful. (4) Ability to achieve their country’s objectives may have enhanced the sense of well-being of Japanese people. However the agency of the Japanese people in their industrial success is probably derived from factors beyond this sense of well-being. (5) Japanese people’s adherence to ethos of duty, loyalty and goodwill can well be explained within the paradigm of self-interested behavior. 35. Of the options presented below, which one is the best example for the ideas propounded in the passage? (1) ‘Change for Equality’ was a campaign by women of Iran to remove discrimination against women in their country. Activities of the movement were attacked and jailed by the government, but the campaign continued. (2) In January 2011, the Egyptian people came out against the regime to topple it. Their grievances included police atrocities, state emergency laws, lack of free election, and lack of freedom of speech, corruption, unemployment, food price inflation and low minimum wages. (3) A worker immolated himself to highlight injustice being perpetrated by the management against the employees in the company. (4) The factory workers carried on with the strike in demand for increased wages, even though they were not paid wages for the duration they were on strike. (5) A politician went on a hunger strike against corruption which not only galvanized the state government in enacting new laws, but also increased his image in the minds of the voters. 36. Read the sentences given below and choose the option that is best in accordance with the ideas in the passage. I. There is a need to distinguish between the agency aspect and the well-being aspect of a person. II. A person can be conceptualized in terms of either agency or well-being. 38. Which of the following sentences is grammatically incorrect? (1) Bats are able to fly in the dark. (3) Bats have the ability to fly in the dark. (4) Bats cannot fly in the dark if it rains. (5) Bats have the ability of flying in the dark, if it does not rain. 39. Alfredo, Diego and Lionel are discussing Argentinean football. Alfredo: Argentina was a football powerhouse. Diego: Argentina is a football powerhouse. Which of the following cannot be inferred from the above conversation? (1) Lionel is optimistic about the future. (2) Alfredo, Diego and Lionel may disagree on certain things. (3) Diego views the present positively. (4) Alfredo completely disagrees with Diego. (5) Alfredo has positive feelings about the past. 40. Choose the grammatically correct sentence from the options given below. (1) Surprisingly, given the recent labour problems in the factory, the factory manager has enjoyed considerable support from they who had previously challenged his leadership. (2) Surprisingly, given the recent labour problems in the factory, the factory manager has enjoyed considerable support from them who had previously challenged his leadership. (3) Surprisingly, given the recent labour problems in the factory, the factory manager has enjoyed considerable support from he who had previously challenged his leadership. (4) Surprisingly, given the recent labour problems in the factory, the factory manager has enjoyed considerable support from those who had previously challenged his leadership. (5) Surprisingly, given the recent labour problems in the factory, the factory manager has enjoyed considerable support from that who had previously challenged his leadership. 41. Ethologists, people who study animal behavior, have traditionally divided an organism’s actions into two categories: learned behavior (based on experience) and instinctive behavior (based on genotype). Some current scholars reject this distinction, claiming that all behavior is a predictable interaction of experience and genotype. Which of the following, if true, most strengthens the arguments made in the sentence above? (1) All organisms with identical genotypes and identical experience sometimes respond differently in different situations. (2) All organisms with different genotypes and identical experience always respond identically in identical situations. (3) All organisms with similar genotypes and similar experience always respond differently in identical situations. (4) All organisms with identical genotypes and identical experience always respond identically in identical situations. (5) All organisms with identical genotypes and different experience always respond identically in identical situations. 42. The benefits of psychotherapy result not only from the advice the therapist gives but also from the supportive relationship offered to the patient. Even though this relationship may cost large amounts of money over many years, most patients interpret the therapist’s concern for them as genuine and identify this caring relationship as the primary factor in improving their mental health. However, recent studies have found that only eight percent of therapist/patient relationships continue after the patient terminates formal paid visits. Which of the following is in accordance with the ideas contained in the passage? Choose the best option. (1) therapists are equally concerned with moneymaking and their patients’ well-being. (2) reading published articles of reputed psychotherapists will hardly be beneficial. (3) therapists can always treat mental illness without the use of prescription drugs. (4) therapists who terminate relationships are likely to improve mental health of their patients. (5) eight percent of patients will continue to improve after termination of therapy. 43. Most of the Asian countries have trade-deficit with China. Bangladesh’s trade deficit with China this year has increased by 35%. Despite large increases in exports to China, Indonesia’s trade deficit with China continues to increase. So does that of South Korea, home of Samsung Electronics, one of the world’s largest manufacturers of electronic gadgets. Which of the following, if true, would be most inconsistent with the above passage? (1) China is the largest manufacturer of parts of electronic gadgets and Samsung Electronics imports parts for their gadgets from China. (2) Exports to Bangladesh are insignificant in proportion of China’s total exports. (3) Exports to Indonesia from China decreased. (4) Indonesia’s chief exports are natural resources. (5) China has trade deficit with Iran. 44. All who studied commerce enjoy sports. No tax consultant enjoys sports. All those who enjoy sports love classical music. If the above sentences are true, which of the following also must be true? (1) No one who enjoys classical music is a tax consultant by profession. (2) Every tax consultant enjoys classical music. (3) No tax consultant enjoys classical music. (4) No tax consultant studied commerce. (5) No one who studied commerce enjoy classical music. 45. The head _______ was annoyed to see a ______ in the soup. 46. Which word is the opposite of the word ‘hypothesize’? 47. Read the sentences and choose the option that best arranges them in a logical order. A. In fact, it is considered as a dumping ground for unwanted people in quite a few organizations. B. In many parts of the country, traditional castes such as Kothari, Kotwal, Bhandari and Bhandarkar have for generations been dealing in procuring, stocking, distributing goods and merchandise. C. This is due to the fact that Indian traders have been trading with many parts of the world. D. However, though the concept of warehousing has been prevalent for over 2000 years, the warehouse has not yet obtained due recognition in modern times. E. The concept of warehousing or stores function is not new in India. 49. Read the sentences and choose the option that best arranges them in a logical order. i. All it has to do is to drive up the inflation rate-examples are the damage Lyndon Johnson’s inflationary policies did to the US economy and the damage which consistently pro-inflationary policies have done to the economy of Italy. ii. It is easy, the record shows, for a government to do harm to its domestic economy. iii. Contrary to what economists confidently promised forty years ago, business cycles have not been abolished. iv. They still operate pretty much the way they have been operating for the past 150 years. v. But there is not the slightest evidence that any government policy to stimulate the economy has impact, whether that policy be Keynesian, monetarist, supply – side or neoclassical. 50. When income tax rates are reduced, there is an increase in taxable income, and an increase in taxable income results in increased total income tax revenues for the government. Which of the following is analogues to the argument above in terms of its logical features? (1) If the city municipal corporation increases taxes on property by 1% it will raise tax revenues, which can be used for garbage disposal management. (2) The Leader of the Opposition at the Parliament argued that a restriction on the import of Chinese manufacturing products will increase the sales of Indian manufacturing products. (3) An advertisement using more than 25 words of text will not be read, and when an advertisement is not read, the product is not sold. Therefore, the fewer words an advertisement has, the more effective it will be in promoting its product. (4) The balance of payment of a country will improve if the country reduces its imports and increases exports. 51. Not wanting to present an unwanted optimistic picture in the board meeting, the CEO estimated the sales growth ______. Read the following passage and provide appropriate answers for the questions 52 – 55. The idea of demarcating certain areas within the country as special economic zones to promote investment and growth is not new. A large country unable to provide the kind of facilities and environment that can attract foreign investment throughout the country often finds it feasible and attractive to carve up some of its areas where such facilities can be provided. The laws and procedures for setting up new industries are waived to make the area business-friendly with developed infrastructure and a one-window interaction with government. In addition, huge tax benefits are promised to lure investors. China’s experience shows that if chalked out and implemented with care such a policy can accelerate the flow of capital and technology from abroad and thereby speed up growth. However, SEZs may not be the best option in all situations to clear the bottlenecks in growth. India’s experience with export processing zones (EPZs) bears this out. They have failed in India for the simple reason that the factors that made the SEZs successful in China have been absent here. In India, as in China, EPZs were thought of as a way of providing an escape route from the stranglehold of control that prevailed over the Indian economy. But even while promising to ease the rigours of controls, Indian policy-makers could not give up their penchant for micromanaging from the centre and undoing the promised relaxations with all kinds of qualifications and “guidelines”. Over last two decades India has evolved into a market economy and much of governmental control has disappeared, but the flow of foreign direct investment has not reached anywhere near the levels of China. Besides, infrastructure building has fallen far short of what is required. Even after three years of the enactment of the Electricity Act (2003), private investment in electricity generation is still a trickle with the states refusing to give up the monopoly of their electricity boards in the matter of purchase of the power generated. While swearing by growth, governments at both the centre and the states cite the fiscal responsibility laws to plead their helplessness in making the required investments to improve infrastructure. Given the situation, the SEZs have apparently been thought of as a simple way out. In its enthusiasm for SEZs the commerce ministry forgot two critical lessons of the Chinese experience, viz., that an SEZ must be of an adequate size to provide opportunities for reaping the benefits of large-scale operations and their number should be few. Every industry or economic activity worth its name is now seeking SEZ status. Proposals are now being floated to invite foreign educational institutions to come to India with promises of SEZ treatment! The finance ministry apprehends a loss of nearly ₹ 1,75,000 crore in direct taxes, customs duties and excise duties over the next five years. (1) highlight the failure of Indian policy makers regarding EPZs. (2) narrate the pros and cons of SEZs. (3) compare between the Indian EPZs and Chinese SEZs. (4) oppose the proliferation of SEZs in India. (5) argue that India should imitate the Chinese policies regarding SEZs. (1) SEZs may be the best option for countries unable to provide infrastructure and business environment to attract foreign direct investment. (2) SEZs must be large enough to house large scale operations. (3) fiscal responsibility laws actually limit the investment on infrastructure by the Government of India. (4) government of India must limit the number of SEZs. (5) SEZs cause loss of tax revenue for the central Government. (1) SEZ treatment of foreign educational institutes in India. (2) qualifiers undoing relaxation of government control. (3) tax benefits to strategically promote SEZs. (4) monopoly of state electricity boards in power purchase. (5) lack of Government initiative in infrastructure development. Read the following passage and provide appropriate answers for the questions 56 – 57. This is one of the unanswered questions that I want to explore. I believe that this is certainly one of the deeper questions about technology. Why do I say so? Without evolution technologies seem to be born independently and improve independently. Each must come from some unexplained mental process, some form of creativity or thinking outside the box that brings it into existence and separately develops it. With evolution, new technologies would be birthed in some precise way from previous ones, albeit with considerable mid-wifing, and develop though some understood process of adaptation. In other words, if we could understand evolution, we could understand the most precious of processes: innovation. But, let me define evolution before I proceed further. The word evolution has two general meanings. One is the gradual development of something, as with the evolution of ballet or the English madrigal. The other is the process by which all objects of some class are related by ties of common descent from the collection of earlier objects. The latter is what I mean by evolution. 56. Which of the following can be inferred from the passage? I. The author’s main concern is to develop a theory of innovation. II. The author is interested in putting forth a theory of technological evolution. III. The author believes before developing a theory of technological evolution, one needs to investigate whether technology evolves at all. IV. Evolution, as the author puts it, is a sense of common relatedness. 57. In 1867, S. Colum Gilfillan, a sociologist traced the evolution of ships from the dugout canoe to the modern steamship of the day. Many theories propose the existence of a technology in many forms. 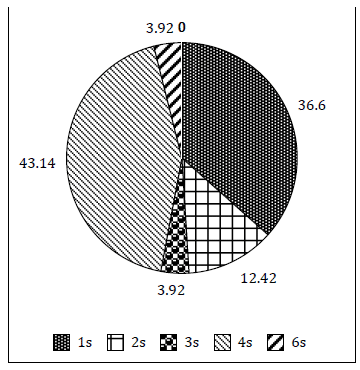 From these variations, some perform better and are selected for further use and development. Till date the people who have thought hardest about the general questions of technology have only been social scientists. They have viewed technology from the outside as stand-alone objects without studying earlier technologies. Some technologies, for example, the laser, the jet engine, the radar, the quick sort algorithm and the locomotive just appear, or at least they seem to just appear unlike novel biological species which are versions of earlier objects. Radar descends from radio but you can vary 1930s radio circuits as radically you like but you will never get radar. Radar requires a different principle. Assuming the above statements are true, which option would most strengthen the author’s premise that the question that he has identified has not been solved as yet? 58. Three Vice Presidents (VP) regularly visit the plant on different days. Due to labour unrest, VP (HR) regularly visits the plant after a gap of 2 days. VP (Operations) regularly visits the plant after a gap of 3 days. VP (Sales) regularly visits the plant after a gap of 5 days. The VPs do not deviate from their individual schedules. CEO of the company meets the VPs when all the three VPs come to the plant together. CEO is one leave from January 5th to January 28th, 2012. Last time CEO met the VPs on January 3, 2012. When is the next time CEO will meet all the VPs? 59. 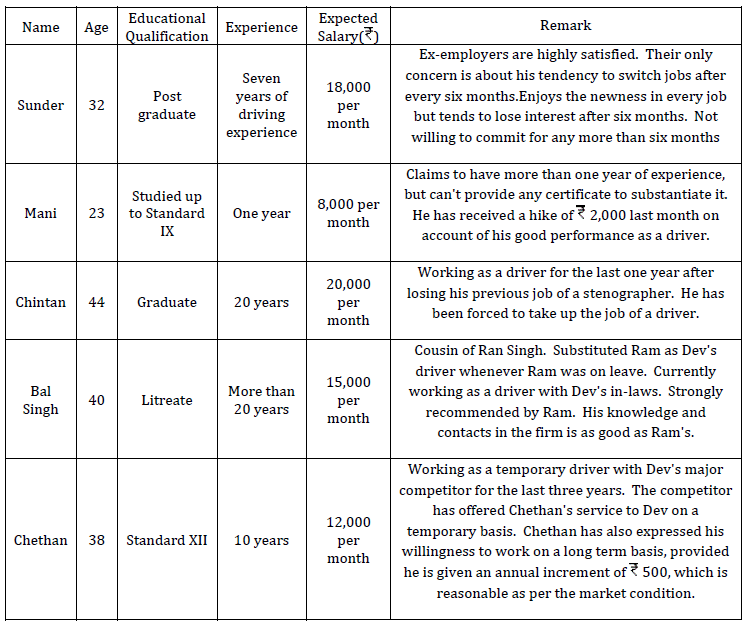 Ramesh analysed the monthly salary figures of five vice presidents of his company. All the salary figures are integers. The mean and the median salary figures are ₹ 5 lakh, and the only mode is ₹ 8 lakh. Which of the options below is the sum (in ₹ lakh) of the highest and the lowest salaries? The following graphs shows the revenue (in $ million) of three companies in their initial six years of operations, in an economy which is characterized by a persistent inflation. 60. In 2010, which could be a valid statement about the revenues (adjusted for inflation) of these three companies? (1) Revenues of all three companies were equal. (2) Revenues of all three companies could be equal. (3) Revenue of Yahoo was definitely less than Facebook which was definitely less than Google. (4) Total of Yahoo and Facebook was definitely higher than that of Google. 62. What would have been Facebook’s revenue (in $ million) in its sixth year of operation if the company had matched Google’s percentage growth in revenues from the fifth to the sixth year? Choose the option that is nearest to the answer. 63. Tina, Mina, Gina, Lina and Bina are 5 sisters, aged in that order, with Tina being the eldest. Each of them had to carry a bucket of water from a well to their house. Their buckets’ capacities were proportional to their ages. While returning, equal amount of water got splashed out of their buckets. Who lost maximum amount of water as a percentage of the bucket capacity? 64. Ram, a farmer, managed to grow shaped- watermelons inside glass cases of different shapes. The shapes he used were: a perfect cube, hemi-spherical, cuboid, cylindrical along with the normal spherical shaped watermelons. Thickness of the skin was same for all the shapes. Each of the glass cases was so designed that the total volume and the weight of the all the watermelons would be equal irrespective of the shape. A customer wants to but water-melons for making juice, for which the skin of the watermelon has to be peeled off, and therefore is a waste. Which shape should the customer buy? 65. A man borrows ₹ 6000 at 5% interest, on reducing balance, at the start of the year. If he repays ₹ 1200 at the end of each year, find the amount of loan outstanding, in ₹, at the beginning of the third year. 68. Nikhil’s mother asks him to buy 100 pieces of sweets worth ₹ 100/-. The sweet shop has 3 kinds of sweets, kajubarfi, gulabjamun and sandesh. Kajubarfi costs ₹ 10/- per piece, gulabjamun costs ₹ 3/- per piece and sandesh costs 50 paise per piece. If Nikhil decides to buy at least one sweet of each type, how many gulabjamuns should he buy? 69. A potter asked his two sons to sell some pots in the market. The amount received for each pot was same as the number of pots sold. The two brothers spent the entire amount on some packets of potato chips and one packet of banana chips. One brother had the packet of banana chips along with some packets of potato chips, while the other brother just had potato chips. Each packet of potato chips costs ₹ 10/- and the packet of banana chips costs less than ₹ 10/-. The packets of chips were divided between the two brothers so each brother received equal number of packets. How much money should one brother give to the other to make the division financially equitable? 70. A city has a park shaped as a right angled triangle. The length of the longest side of this park is 80 m. The Mayor of the city wants to construct three paths from the corner point opposite to the longest side such that these three paths divide the longest side into four equal segments. Determine the sum of the squares of the lengths of the three paths. Answer question 71 and 72 based on the following information. Ramya, based in Shanpur, took her car for a 400 km trip to Rampur. She maintained a log of the odometer readings and the amount of petrol she purchased at different petrol pumps at different prices (given below). Her car already had 10 litres of petrol at the start of the journey, and she first purchased petrol at the start of the journey, as given in table below, and she had 5 litres remaining at the end of the journey. 71. What has been the mileage (in kilometers per litre) of her car over the entire trip? 72. Her car’s tank-capacity is 35 litres. Petrol costs ₹ 45/- litre in Rampur. What is the minimum amount of money she would need for purchasing petrol for the return trip from Rampur to Shanpur, using the same route? Assume that the mileage of the car remains unchanged throughout the route, and she did not use her car to travel around in Rampur. (5) Data insufficient to answer. 73. A medical practitioner has created different potencies of a commonly used medicine by dissolving tables in water and using the resultant solution. This way he can give fractions of tablets based on the intensity of infection and the age of the patient. 74. Ram prepares solutions of alcohol in water according to customers’ needs. This morning Ram has prepared 27 litres of a 12% alcohol solution and kept it ready in a 27 litre delivery container to be shipped to the customer. Just before delivery, he finds out that the customer had asked for 27 litres of 21% alcohol solution. To prepare what the customer wants, Ram replaces a portion of 12% solution by 39% solution. How many litres of 12% solution are replaced? 75. City Bus Corporation runs two buses from terminus A to terminus B, each bus making 5 round trips in a day. There are no stops in between. These buses ply back and forth on the same route at different but uniform speeds. Each morning the buses start at 7 AM from the respective terminuses. They meet for the first time at a distance of 7 km from terminus A. Their next meeting is at a distance of 4 km from terminus B, while travelling in opposite directions. Assuming that the time taken by the buses at the terminuses is negligibly small, and the cost of running a bus is ₹ 20 per km, find the daily cost of running the buses (in ₹). 76. Shyam, a fertilizer salesman, sells directly to farmers. He visits two villages A and B. Shyam starts from A, and travels 50 meters to the East, then 50 meters North-East at exactly 45° to his earlier direction, and then another 50 meters East to reach village B. If the shortest distance between villages A and B is in the form of a√(b+ √c) meters, find the value of a + b + c.
77. Three truck drivers, Amar, Akbar and Anthony stop at a road side eating joint. Amar orders 10 rotis, 4 plates of tadka, and a cup of tea. Akbar orders 7 rotis, 3 plates of tadka, and a cup of tea. Amar pays ₹ 80 for the meal and Akbar pays ₹ 60. Meanwhile, Anthony orders 5 rotis, 5 plates of tadka and 5 cups of tea. How much (in ₹) will Anthony pay? 78. A computer program was tested 300 times before its release. The testing was done in three stages of 100 tests each. The software failed 15 times in Stage I, 12 times in Stage II, 8 times in Stage III, 6 times in both Stage I and Stage II, 7 times in both Stage II and Stage III, 4 times in both Stage I and Stage III, and 4 times in all the three stages. How many times the software failed in a single stage only? 79. Suresh, who runs a bakery, uses a conical shaped equipment to write decorative labels (e.g., Happy Birthday etc.) using cream. The height of this equipment is 7 cm and the diameter of the base is 5 mm. A full charge of the equipment will write 330 words on an average. How many words can be written using three fifth of a litre of cream? Answer question nos. 80 – 81 based on the following information. The following pie chart shows the percentage distribution of runs scored by a batsman in a test innings. 80. If the batsman has scored a total of 306 runs, how many 4s and 6s did he hit? 81. If 5 of the dot balls had been hit for 4s, and if two of the shots for which the batsman scored 3 runs each had fetched him one run instead, what would have been the central angle of the sector corresponding to the percentage of runs scored in 4s? 82. Carpenter Rajesh has a circular piece of plywood of diameter 30 feet. He has cut out two disks of diameter 20 feet and 10 feet. What is the diameter of the largest disk that can be cut out from the remaining portion of the plywood piece? i. Jose has three sons. ii. The sum of the ages of Jose’s sons is 13.
iii. The product of the ages of the sons is the same as the age of Lionel. iv. Jose’s eldest son, Zizou weighs 32 kilos. v. The sum of the ages of the younger sons of Jose is 4.
vi. Jose has fathered a twin. vii. Jose is not the father of a triplet. viii. The LCM of the ages of Jose’s sons is more than the sum of their ages. Which of the following combination gives information sufficient to determine the ages of Jose’s sons? • In case of profits till ₹ 200,00 per annum, profits would be shared in the radio of the invested capital. • Profits from ₹ 200,001 till ₹ 400,000 Shyam would take 20% out of the profit, before the division of remaining profits, which will then be based on ratio of invested capital. • Profits in excess of ₹ 400,000, Shyam would take 35% out of the profits beyond? 400,000, before the division of remaining profits, which will then be based on ratio of invested capital. If Shyam’s share in a particular year was ₹ 367000, which option indicates the total business profit (in ₹) for that year? 85. A property dealer bought a rectangular piece of land at ₹ 1000/sq. ft. The length of the plot is less than twice its breadth. Due to its size, there were no buyers for the full plot. Hence he decided to sell it in smaller sized pieces as given below. The largest square from one end was sold at ₹ 1200/sq. ft. From the remaining rectangle the largest square was sold at ₹ 1150/sq. ft.
Due to crash in the property prices, the dealer found it difficult to make profit from the sale of the remaining part of the land. If the ratio of the perimeter of the remaining land to the perimeter of the original land is 3 : 8, at what price (in ₹) the remaining part of the land is to be sold such that the dealer makes an overall profit of 10%?